Here, Shri Mahaprabhu Vallabhacharya stayed at the home of Jagannath Josi upon who the guru was very pleased. 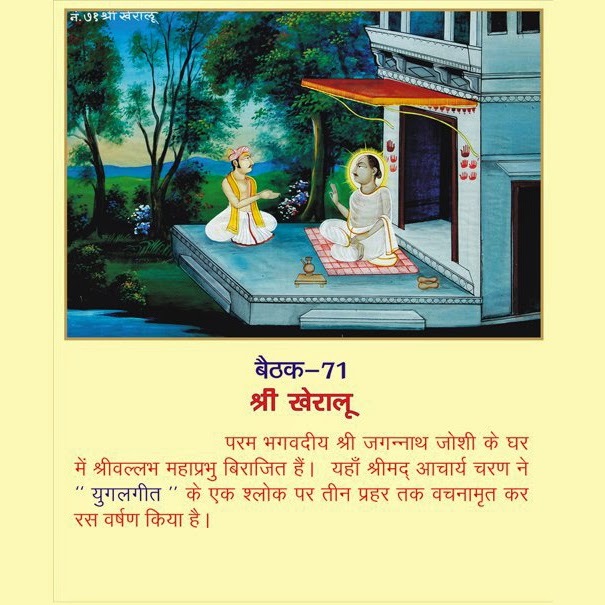 After Shri Mahaprabhuji prepared the meals and made the offering he partook of the prasada before Jagannath requested him the explain to him the Gopi’s “Yugal Gita” song which appears in the 10 canto of the Shrimad Bhagavatam. For nine hours Shri Mahaprabhuji spoke and immersed all present there in complete transcendental bliss. Form there, he proceeded to siddhapur.